Open Doors was established in 1955 when Brother Andrew, a newly committed Christian, began smuggling Bibles into Eastern Europe. Since then Open Doors has expanded to work in more than 60 countries. For more than 60 years, Open Doors has worked in the world's most oppressive and restrictive countries, strengthening Christians to stand strong in the face of persecution and equipping them to shine Christ's light in these places. 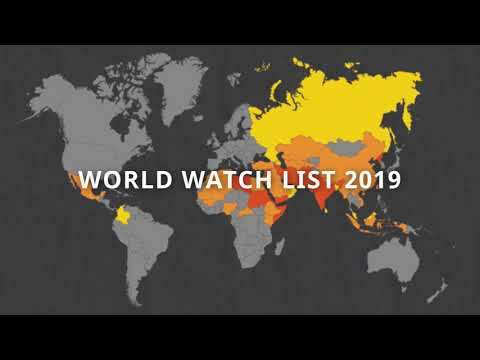 Open Doors empowers persecuted Christians by supplying Bibles and Christian literature, training Christian leaders, community development and uniting believers in the West in prayer for Christians, who are the most persecuted religious group in the world and are oppressed in more than 70 countries. "Thank you for your faithful work! We love Open Doors magazines and pray daily for the persecuted countries. God bless you!" "Thank you for reaching out to our persecuted brothers and sisters in Christ and also reaching those who need a savior"